In March 2018, the GBCA embarked on an ambitious journey to reshape the Green Star rating system and bring you the next evolution of the tools. Green Star Future Focus will see the rating system evolve and adapt to ensure the sustainable built environment delivers what it needs to, whilst also responding to global megatrends and emerging challenges. Currently, four rating tools are under development to realise this vision. 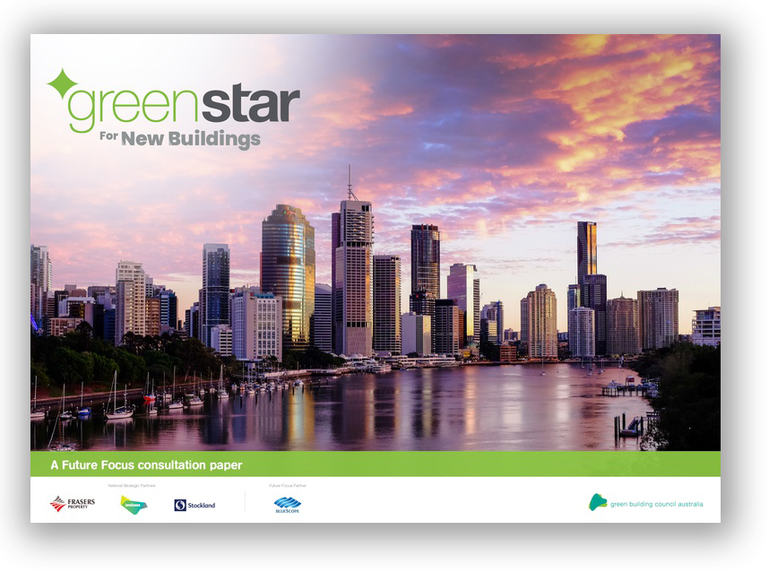 The GBCA are currently seeking feedback on the first rating tool under development – Green Star for New Buildings. Green Star for New Buildings aims to meet the demands of the next decade and beyond with aspirational benchmarks for the design and construction of buildings. It also provides a pathway for building owners to address carbon emissions over time. Sets new levels of achievement for project teams with the highest of ambitions. Please download and save the PDF to your desktop prior to populating the document and submitting your feedback. Some browsers are unable to submit the form via the internet. We thank the following organisations for their leadership and their support of our activities in this space. We are currently consulting on the proposed changes to Green Star through the first rating tool, Green Star for New Buildings. This process will run for two months, from April 10th to June 10th. Below is the development timelines for Green Star for New Buildings. Below are the timelines for development of the other rating tools. If you are a leader who wants to get a head start on Green Star for New Buildings, and wants to drive industry forward, our Early Access program is for you. We’re looking for buildings in the early design stage, regardless of sector. During the Early Access Program, you will obtain draft credits, dedicated technical support, promotion and case studies, and the opportunity to shape the future of the built environment. Pay a registration and participation fee. The registration and participation fee will cover the additional technical support to help you deliver improved outcomes for your building. We are seeking like-minded organisations to partner with us for the next three years on this exciting evolution. In return, your organisation will be showcased as a leader both locally and internationally. Your organisation will receive exclusive briefings, putting you ahead of the competition, as well as unprecedented exposure over the next three years across GBCA communications, events, courses, webinars and podcasts. Becoming a Future Focus Partner is your opportunity to associate your brand with Green Star, one of the world’s leading rating tool, long established as a driving force in the transformation of the built environment. We need your support in this exciting journey. Keep an eye on our website for update on webinars, workshops, and opportunities to comment on draft proposals. The following documents were released in 2018 to commence the Future Focus journey. These papers are now outdated and the GBCA are not receiving feedback on any. 15 years ago we set out to transform the built environment through our rating system Green Star. Working together with industry, we’ve affected huge change in the built environment. Since 2003, more than 1,750 buildings have sought and achieved Green Star certification. This is what transformation looks like. Green Star Future Focus offers an opportunity to demonstrate your commitment to the innovation and leadership that has helped drive our industry’s success to date. If you are interested in discussing the benefits of your organisation’s involvement in Green Star Future Focus in more detail, please contact Debbie Roussakis, Partnerships Coordinator.